ensure the member is given and understands the obligations on their part when receiving assistance from UNISON. Download the UNISON CASE Form (available in word, pdf, and large print formats). The UNISON Caseform should be used for all workplace issues that require (or may lead to) ongoing support from the steward/branch and/or Regional Office to individual member(s) who have approached the union for advice, assistance or representation. A UNISON Case form is required for every individual case referred on – both within the branch and to Regional Office.Typically sections 1-14 of the Caseform should be completed by the member (with branch assistance) in the first instance. A referral to UNISON Regional Office will require all sections, including 15-22 of the Caseform to be completed. In collective referrals a separate Case form is required for each member the branch believes may have a claim for legal assistance and/or representation. To avoid any difficulties with reading member’s handwriting, branches are strongly encouraged to use the electronic versions of the UNISON CASE form, completing the form digitally prior to saving, printing and signing. During the first meeting with a member you are strongly advised to explain the content and implications of the conditions for providing representation to them. This can be found as a tear-off slip at the rear of the Caseform. Give them a copy of this and ask them to confirm they have received this at Section 14 of the Caseform (where their signature is required). Please also ensure that Section 13, the Legal Services Agreement is signed. Please ensure your branch office, or identified branch lead officer for representation (where there is no office), is provided with the name, employer and workplace of the member you are supporting. They may also require a copy of the case papers in order to ensure arrangements are in place should cover be required. Please ensure that the individual is a UNISON member, confirm when they joined and that they have paid and are paying at the correct rate of subscriptions and not in arrears. (Rule C 5.1, agreed at the 2017 National Delegate Conference sets out that membership commences on the date details of membership are entered into the membership records system). Representation is not provided where the issue for which the member seeks assistance occurred or first became apparent to the member before the member joined the union. See sections 4.1 and 6.3 of the UNISON member representation guide. The member must have been in membership of the union for at least 4 weeks prior to the incident or occurrence that leads her/him seeking legal assistance from the union. The member must not be in arrears of subscriptions. Members dismissed or made redundant……may acquire unemployed membership for two years from the date of dismissal, redundancy, or agreement. This entitles them to receive benefits from the union for up to two years after that date, provided they remain unemployed. A member may apply at any time for retired membership if she/he has had at least two years’ continuous membership immediately prior to their retirement from employment within those areas of work set out in Rule C.1 and who are retired. Advice on assistance for new members should always be sought from the lead branch officer or your Regional or Area Organiser before any action is agreed with the member. What level is the case at? Investigations and low level disciplinary and grievance hearings are always expected to be dealt with by the branch. Dismissal and final stage appeal hearings should in most cases be dealt with by the branch, unless the branch’s Regional Organiser confirms the branch is unable to provide appropriate local representation and/or the case is of strategic/legal importance. Complex and discrimination cases and all potential legal claims should be referred to Region (all potential legal claims must be referred to Region no later than one month before any applicable Employment Tribunal deadline). Fitness to Practice cases (e.g. NMC and HCPC referrals) and final stage pensions appeals should also be referred to Region. Regional case advice surgeries are provided fortnightly in each team area by the Regional Organiser detailed at the end of this guidance to provide in person or phone advice to stewards; dates on the SE website. Email and telephone advice can also be sought from the Case Lead RO outside of these dates. Branch case surgeries and training can be arranged with your Regional Organiser as part of Branch Development. Your branch’s Regional and Area Organisers are also available to provide advice on casework to stewards and officers. 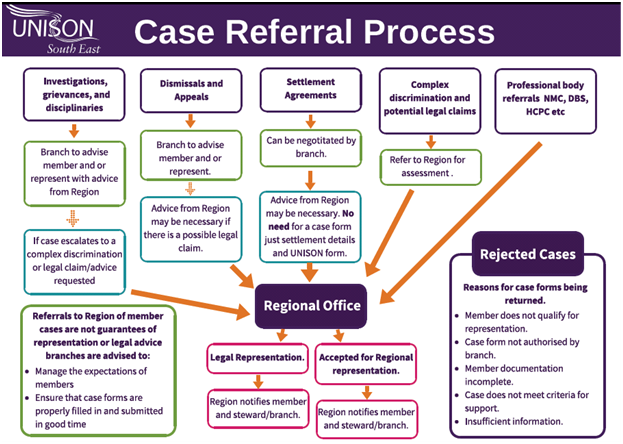 See the Case referral process flow chart for a visual guide. Evidence of the claim e.g. copies of witness statements you already have, photographic evidence, correspondence etc. 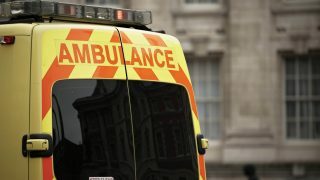 The guidance above should be read in conjunction with the latest UNISON ET Representation Scheme Protocol Guidance for Branches 2017 (issued October 2017).